With a built-in NFC chip, you can use your credit and debit cards on-the-go anywhere that accepts contactless payments. See participating banks. Available on Special Edition only. Get personalized on-screen workouts that play on your wrist, coach you through each move and adapt based on your feedback. Available on Special Edition and Versa only. Store and play 300+ songs on your watch—plus download your favorite Pandora stations or Deezer playlists. ** Available on Special Edition and Versa only. Personalize the hi-res color touchscreen on Fitbit Versa family watches by choosing from a variety of clock faces designed for any occasion. 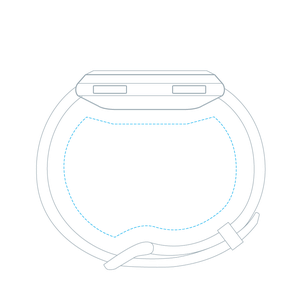 Screen Size 0.9478" x 0.9478"
Fitbit Versa Lite Edition, Versa and Versa Special Edition are water resistant to 50 meters. After swimming or getting the band wet, we recommend drying the band because, as with any wearable device, it&apos;s best for your skin if the band is clean and dry. 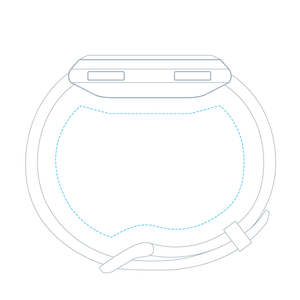 We do not recommend wearing Fitbit Versa Lite Edition, Versa or Versa Special Editions in a hot tub or sauna. See www.fitbit.com/productcare for more details. 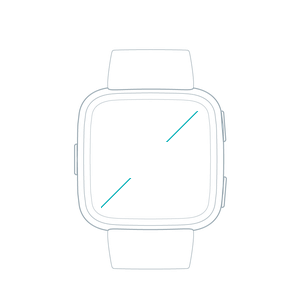 The Fitbit Versa Lite Edition and Versa classic band is made of a flexible, durable material similar to that used in many sports watches, and includes an aluminum watch case and buckle. The woven band is made from a comfortable polyester and includes an aluminum watch case and buckle.